lives and works in Otwock and Warsaw. 13 x 21.5 x 18 cm (5 x 8½ x 7"). With his sculpture (resembling a bed) shown at Venice Biennale of 1990, Miroslaw Balka (born 1958 in Warsaw, Poland; lives and works in Warsaw) initiated a rapid succession of exhibitions that took place in major institutions during the following year, to which he gave the overall title "My body cannot do everything I ask for." This only partially referred to his sudden success; it also pointed to the fact that Balka´s works are often related to his body measurements, by which means the sculptures lose the randomness of the material and acquire human dimensions with which the viewer can identify. Similarly, the objects seem to have their own specific history; the viewer cannot escape the impression that the artist has elaborated a piece of his biography into a work that stands for many different experiences. 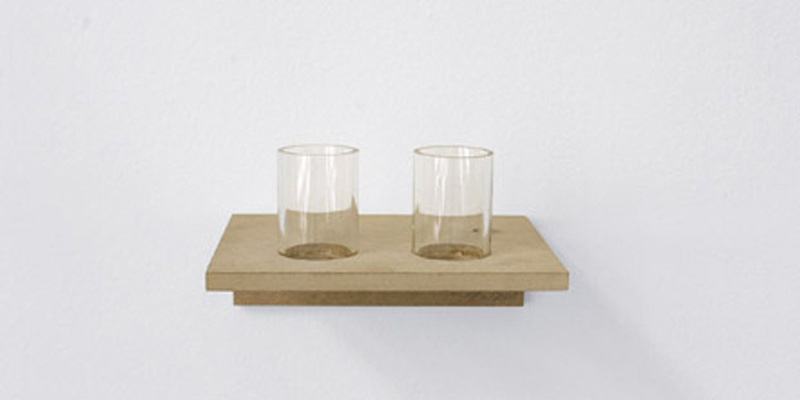 The shelf shown here, formally alluding to a human scull, »is about emptiness and disappearance«.